Starting this fall, in an obviously manufactured “Problem-Reaction-Solution” scenario some Pinellas County, Florida schools will become the first in the country to use an infrared beam to help zip students through cafeteria lunch lines. 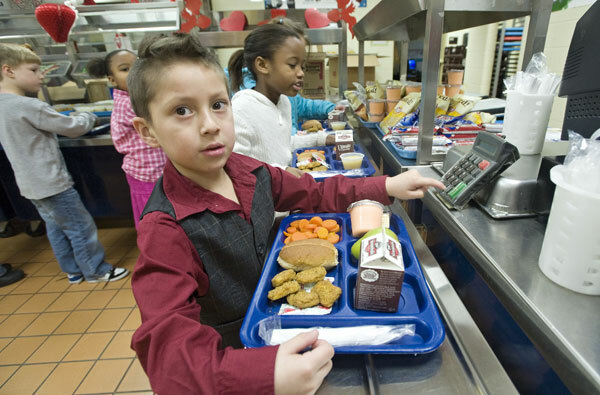 The district is outfitting all of its middle and high schools with Fujitsu PalmSecure technology that will scan a student’s unique palm vein pattern and match it to his or her meal plan. Faster lunch lines have become a priority for schools as they contend with overcrowding or squeeze lunch periods to increase class time and boost students’ scores. That’s what happened at Boca Ciega High School, which is under state oversight after receiving a low grade. Boca Ciega which has about 200 students eat lunch in the cafeteria each day, piloted the devices late last school year, said Art Dunham, Pinellas’s food services director. The pressure to incorporate more fresh produce into school lunch also makes quicker lines vital, said Diane Pratt-Heavner, a spokeswoman for the School Nutrition Association. “It takes longer to eat an apple, but you can slurp apple sauce more quickly,” she said. A 2009 survey of 1,207 school districts showed that 4.4 percent used biometrics like fingerprinting, though Pratt-Heavner said she has never heard of a palm scan being used. Pinellas students will have the option of using their 10-digit identification number rather than the scan, which is more numbers than Social Security uses to uniquely track every person born in the US. But Dunham hopes students will become more comfortable with it. So far, she said there have been few privacy complaints. The Pinellas School Board approved a $234,000 contract on June 14 that includes nearly $80,000 for 200 of the new Fujitsu scanners and the remainder for software, upgrades and maintenance. At least three other school districts in Florida already have expressed interest in it, as have schools in Maine, Alaska, California and Puerto Rico. The PalmSecure technology has been integrated into [Pinellas County Schools] existing MCS Software’s Point-of-Sale system to provide a more reliable, hygienic, accurate, and secure authentication solution that is also easier to use and maintain. The fully integrated solution combines PalmSecure biometric technology and the MCS POS system to provide enhanced security without student PINs or fingerprint scanners and replaces them with a user-friendly PalmSecure palm vein authentication solution. All food service program transactions will be done using PalmSecure biometric technology and the MCS Software POS system. The use of palm vein biometric scanning for food service program transactions has many advantages. For example, a simple palm vein scan rapidly identifies the student, assuring the students identity thereby reducing waste and impersonation, while providing a level of reliability not found in legacy fingerprint systems which often malfunctioned or simply froze, causing repeated disruptions in the student cafeteria service. PalmSecure technology has been deployed worldwide in a wide range of vertical markets, including security, financial, banking, healthcare, commercial enterprises and educational facilities. Additional applications include physical access control, logical access control, retail POS systems, ATMs, kiosks, time and attendance management systems, visitor ID management and other industry-specific biometric applications.